Aircraft Warning Lights / Aviation obstruction lights are lighting devices attached to tall structures: buildings, wind turbines, bridges etc. and used as collision avoidance measures. Such devices make the structure much more visible to passing aircrafts and is usually used at night, although in some countries they are used in the daytime also. Basically obstruction lights typically comes in various intensities (low, medium, high) and either fixed or flashing. The standards, rules and recommendations etc. for the light marking of obstructions are defined by various organisations. The most important is "ICAO - International Civil Aviation Organization". Below you will find info regarding different countries. ICAO High-Intensity Type A, 200.000 cd white flashing, LED Aviation Obstruction Lights. 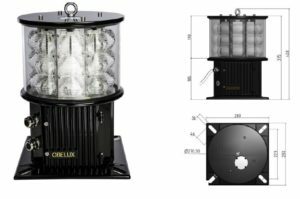 Obelux high-intensity obstruction lights are designed to mark very tall structures (typically above 150 meters) such as broadcast masts, towers, buildings, cranes and chimneys. Heliport beacon is designed to provide a long range visual guidance and identification of a heliport and insure safe environment for helicopter operations. 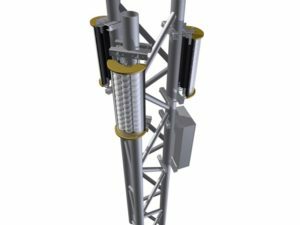 A heliport beacon is typically located on or adjacent to the heliport preferably at an elevated position and so that it does not dazzle a pilot at short range. The beacon is fully compliant with ICAO Annex 14 Volume II (section 5.3.2 Heliport Beacon) and also in compliance with Danish regulation: “BL 3-8 Bestemmelser om etablering og drift af helikopterflyvepladser" regarding “lysfyr” (section 8.14.10). In the Danish regulations: "BL 3-21 Lysanlæg for natbeflyvning af offentlige VMC- og private flyvepladser" there is a special requirement for "lysfyr". 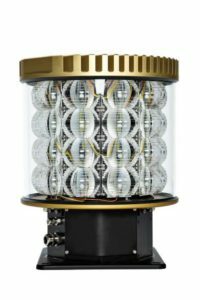 The optical output is fairly unique (see description below) and does not correspond to normal standard ICAO specifications. An aerodrome beacon or rotating beacon is a beacon installed at an airport or aerodrome to indicate its location to aircraft pilots at night. Heliport beacon is designed to provide a long range visual guidance and identification of a heliport and insure safe environment for helicopter operations. 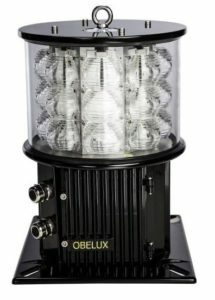 A heliport beacon is typically located on or adjacent to the heliport preferably at an elevated position and so that it does not dazzle a pilot at short range. The beacon is fully compliant with Norwegian regulations: “Forskrift om utforming av store helikopterplasser (BSL E 3-5)" & "Forskrift om utforming av små helikopterplasser (BSL E 3-6)". A Heliport Beacon is designed to provide a long range visual guidance and identification of a heliport and insure safe environment for helicopter operations. The beacon is fully compliant with Swedish regulation: "Helikopterflygplatser på plattformar och flytande konstruktioner som är omgivna av vatten" (TSFS 2012:80) and "Upphöjda helikopterflygplatser" (TSFS 2012:79) and "Helikopterflygplatser på mark- eller vattenyta som kräver godkännande" (TSFS 2012:77).